Opéra de Montréal opened its 37th season with a sumptuous Aida first mounted here in 1994. Yet after 22 years the production is still fresh and captivating. Golden-hued traditional sets (Claude Girard and Bernard Uzan) offered eye-catching visions of ancient Egypt, replete with massive pillars inlaid with statues of pagan gods, and a night scene on the banks of the Nile with a moving felucca set against a luminescent moon and azure sky. The resplendent costumes (Claude Girard) blended felicitously with the predominant colors of the sets. François Racine’s stage direction was comfortably paced, and as a nice touch the crowd admired and poked into the spoils brought back from Ethiopia during the triumphal march. This conceit may have been intended to take our attention away from the surprising dearth of loot. There were also few prisoners. But again, Racine made good use of what was available by lining a half dozen or so crouching along the apron of the stage. The dances (Noëlle-Emilie Desbiens) thrilled. Their flowing, effortless movements reflected a professionalism seen in the best dance troupes. Some of the dancers’ daring, acrobatic moves made me wonder if they hailed from Montreal’s famed Cirque du Soleil! The chorus was splendid. After many years of Claude Webster’s coaching, this ensemble invariably performs with confidence and panache. Whether together or separated into men’s or women’s choruses, they sang in perfect unison with silky intonation and precise articulation. The production was blessed with strong soloists but, more often than not, loudness predominated where delicacy and nuance were required. Bulgarian Kamen Chanev as Radames mostly shouted throughout the evening, and in “Celeste Aida” sang the last note fortissimo rather than letting it fade away as Verdi indicated. Russian soprano Anna Markarova (Aida) sang with a pleasant, full, rounded tone but struggled with her high notes, often rushing and cutting them short, particularly in “O patria mia”. 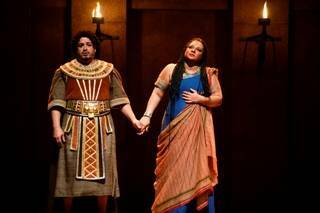 Russian mezzo/contralto Olesya Petrova (Amneris) gave the most engaging performance, both vocally and dramatically. She sang consistently with ease and expressiveness and was totally convincing as the jilted princess. Other standouts were Canadians Phillip Ens (Ramfis) and Myriam Leblanc (the High Priestess). Leblanc is a member of the highly regarded opera school Atelier lyrique de l’Opéra de Montréal. The Orchestre Métropolitain (of which Yannick Nézet-Séguin, despite his elevation to the musical stratosphere, is still Artistic Director and Principal Conductor) provided excellent support under the baton of Paul Nadler.